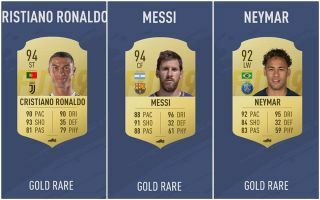 FIFA have released their final ten players as the ratings for FIFA 19 become official, with the winner of the battle for top spot between Cristiano Ronaldo and Lionel Messi revealed. As it turns out, Juventus forward Ronaldo just pips his Argentine rival to take first place on the list, which is now up on the EA Sports official website. Manchester United goalkeeper David de Gea also makes it into the final ten, so is ranked as the best ‘keeper on the game. There are other big names from the Premier League as Chelsea’s Eden Hazard and Manchester City’s Kevin De Bruyne also feature, though it’s rather dominated by Real Madrid. Los Blancos won a third Champions League final in a row last season, so it perhaps shouldn’t be too much of a surprise to see the likes of Luka Modric, Sergio Ramos and Toni Kroos also on the list, while Ronaldo was of course a Madrid player last term as well.